The guide on this page represents the Steam version of the game. 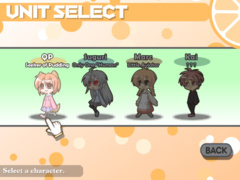 Thank you very much for purchasing "100% Orange Juice". This is an original board game that gathers up Orange_Juice's all-star cast. 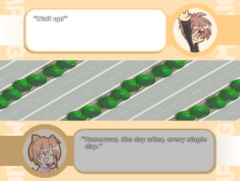 Even if you are familiar with our earlier games, since there are many new elements in 100% Orange Juice, you're advised to use this manual until you are used to playing it. Thank you for supporting us in bringing over great Japanese PC game gems. 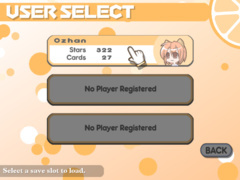 We hope this manual will help you get the most out of "100% Orange Juice" and you'll enjoy it as much as we did. The manual has been revised to be consistent with the English localized version. This is a board game played by using a player unit and a card deck. To attain victory, make full use of your unit and the cards you like. There is a world where dogs, people and machines fly through the air. In that world, a small patch of darkness was born. begins a journey that will span worlds. System requirements are only for reference. Actual performance may vary. *The camera is movable only in particular situations. 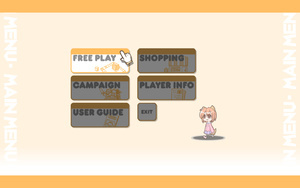 To show the title menu, left-click on the title screen. Left-click over whichever item you want to choose. Start the game as a new player. Restart the game from your save data. Choose New Game on the title screen and create an entry as explained below. Choose a save slot. The game will automatically be saved there. Enter the player's name. This name will be used in the game and cannot be changed afterwards. The name will be used for online play too. *The unit cannot be changed afterwards. 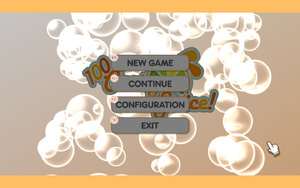 Choose Continue on the title screen and choose the save slot you want to load. There are two ways to change the settings. Full-Color Options Choose 'disabled' in each box if you are experiencing poor performance. 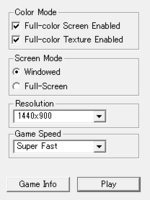 Screen Mode Choose between Windowed or Full Screen display. *Some options, such as the voices, cannot be changed in the start-up pop-up menu. The online settings are explained below. 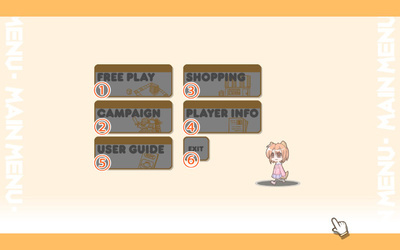 Having started the game, you'll see the menu as shown in the image above. Hover the mouse cursor over whichever item you want and left-click. Select a field you like and play a match with CPU or friends. Play matches following the scenario. Spend stars gained from matches to get new cards. Check your card collection, campaign achievement rate, etc. Return to the title screen. In the Campaign mode, you will play matches following a pre-set scenario. The more you play, the more cards you can buy from the shop, and more fields you may use in Free Play. 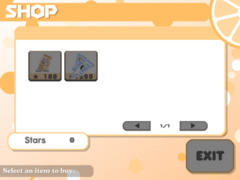 You can buy cards from the shop by spending stars that work as the currency. The result of each match decides how many stars you gain. You can play games on one of the fields that you have already won on. Try playing with line-ups that you can't play with in the campaign mode. You can also enjoy online matches in this mode. The unit whose owner’s turn it is. Various messages appear according to the situation. 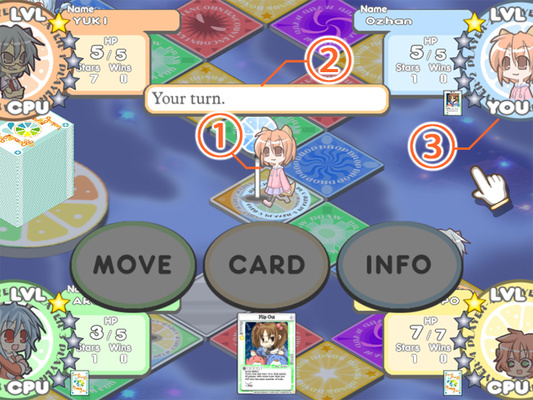 Each player's basic info shows on the four corners. The player's name shows here. The player's basic info shows here. 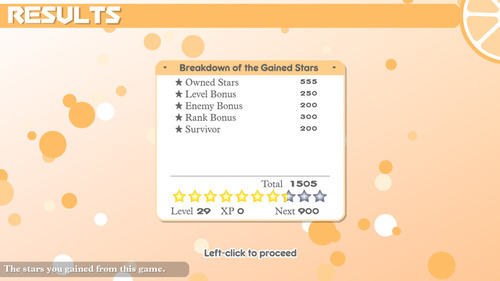 The number of the star marks shows the player's level. The type of the character - "YOU" means the player, "NET" means an online player, "CPU" means a computer controlled enemy. The cards that the player has on hand. You can also see how many cards the other players are holding. The same info as the player's basic info. The Norma that you are supposed to achieve. The card effect(s) being active on or stocked by the player. 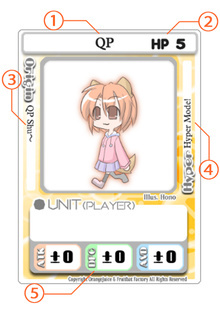 The unit card used by the player. The number of the bonus stars at the beginning of the chapter. The field event(s) in progress. The card effect(s) active or stocked on the field. In order from rarest to most common: R is Rare, U is Uncommon, and C is Common. This is the level you must be in order to use this card. This is the amount of stars you must pay to use this card. Green stars cost 1 star. Yellow stars cost 10 stars. This is the card's type. This is the maximum number of this card you can place in your personal deck. More information on decks later on. These are quotes from the other games. These have no effect on the game whatsoever. This is a card you can use while in Standby. It affects the player who uses it, or in some cases, another targeted player. After being used, some effects take place immediately, while others are stocked. 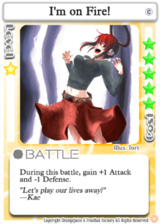 This is a card usable during Battle. It has an effect on the Battle itself, or the unit(s) participating in the Battle. It can give you an advantage in Battle, or give you the opportunity to avoid a disadvantageous situation. This is a card you can set onto the panel you're currently on while in Standby. The next player who stops on that panel will trigger the card's effect. It's difficult to target a specific opponent with these cards, but there are many that could possibly cause a comeback. This is a card used during Standby. There are cards where you cannot choose your target, as well as cards that affect the Field itself. These cards should be used with caution, as they exhibit their effects without regard to the situation. Many Event Cards have unique, flashy effects. This is a card that shows all the statistics for a particular usable character. It is drawn differently from the other cards. This is the Character's name (not the Player's name). This is the Character's max HP. This is the main game that this Character appeared in. This is this Character's unique Hyper Card's Name. These are the Statistics the Character uses in Battle. From the left, there is ATK (Attack), DFC (Defense), and AVD (Evasion). 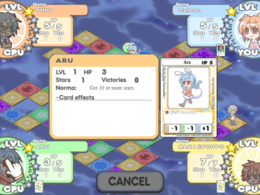 During the game, Hyper Cards may appear for their particular Character. Hyper Cards have effects that represent a Character's unique special abilities and by making good use of these and their paired characters, you can make great progress in your game. Following are the floor types of the game board and the results of stepping onto them. 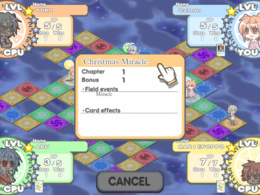 The player's rolls a die and will gain a number of stars according to the roll multiplied by his/her level. 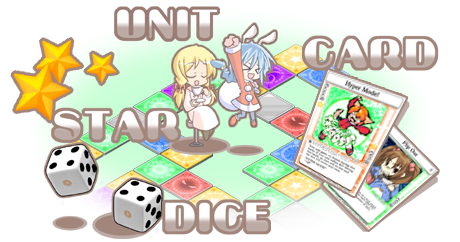 You must roll the dice and will lose a number of stars according to the roll multiplied by his/her level. Draw a card from the deck. 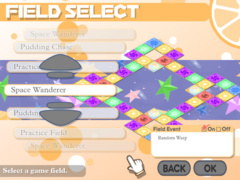 The player will be moved to a random Warp Panel. Fight a battle with a wild unit. 1 HP will be healed, and Norma achievement will be checked. 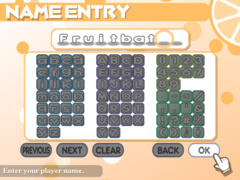 The "Home Panel" is the check panel from which each player started the game. The player is allowed to stop there, if they wish, when they pass over it. *There is a plate on each player's Home Panel whose color corresponds with their icon. There are some Squares that may change type during a Field Event. Bonus, drop or draw panels can transform into this one. The number of the dice to roll, or the number of the cards drawn will be doubled. Fight a battle with a boss unit. There are a score of field events that you can experience. This one occurs in all the fields the first turn after a Character reaches level 4. Note that Boss Encounters will normally occur only once per game but some card effects may cause additional encounters to occur. While a Boss Encounter is in effect, any player who stops on a Boss Encounter square will battle the Boss Unit. This Event will continue until the Boss Unit is defeated. Every 3 Chapters, a Trap Card will be set on a randomly determined square. These Trap Cards are not affiliated with the Center Deck, will not be sent to the Trash Bin when activated, and will therefore not return to the Center Deck afterwards. Every 5 Chapters, all Units will be healed for 1 HP at the beginning of the Chapter. Every 5 Chapters, all Players will receive 1 Card at the beginning of the Chapter. Every 5 Chapters, all players will be warped to a randomly chosen square at the beginning of the Chapter. Every 5 Chapters, Bonus, Drop, and Draw Panels will all become Double Panels. This effect lasts for the duration of the Chapter. Every 5 Chapters, all units will take 1 Damage at the beginning of the Chapter. Every 6 Chapters, all Bonus and Drop panels will become Encounter Panels. This effect lasts for 3 Chapters. 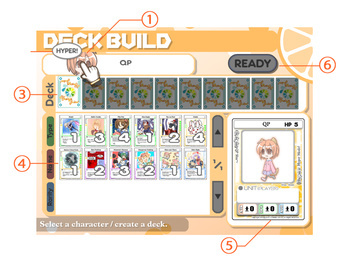 In preparation for the Game, you may now choose your Character and up to 10 Cards to form your Player Deck. This is the Character you will use. You may switch Characters with the ←→ buttons. If you hover over this icon, you can check the Character's Hyper Card. This is your deck of 10 Cards. These are the cards you currently own. 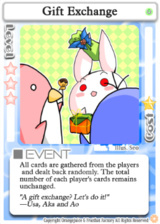 This is an enlarged image of the selected Card. Once you're ready, left click on this button. You may choose any Character whose Character Card you currently own. You may create your Player Deck from any Boost, Battle, Trap and Event cards that you currently own. If there is no card limit for a particular card, then you may include up to 3 of them in your deck. This game uses a set of 48 Cards made of the Player Decks of the 4 participating players, plus 8 Hyper Cards. While in the Deck, Hyper Cards are considered "Blank". When a Player draws a Hyper Card, that card will immediately transform into the Character's unique Hyper Card. 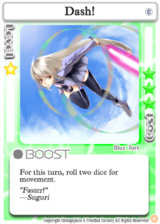 For example: When a Player using QP draws a Hyper Card, it will immediately become a "Hyper Mode!" card. After that, the Hyper Card will be treated as a normal card until it is discarded into the Trash Bin. (If some effect forces a Hyper Card to be traded with another player, it will not transform again to match its new owner). The purpose of the game is to achieve your Norma (=goal, quota). After achieving a Norma, your level will increase, and a harder Norma will be assigned. 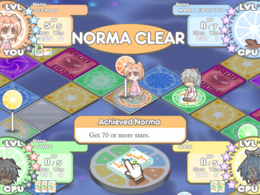 Every player starts with a level-1 Norma, and whoever completes the next Norma after level 5 will be the winner of the game. Whether a Norma has been completed or not is judged when you stop at a Check Panel. 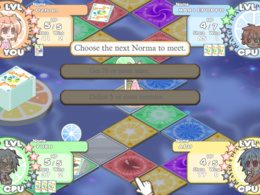 With the Norma achieved, the player's level increases by 1, and the next Norma has to be chosen. What kinds of Norma are there? There are two kinds of Norma; collecting a certain amount of stars, or beating a certain amount of units. 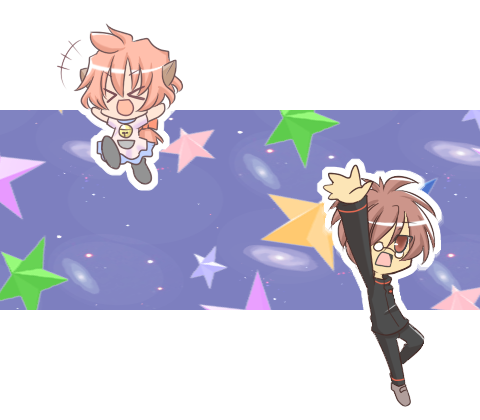 Collecting stars is relatively easy, but they can be lost. The number of the units you beat will never decrease, but this Norma can be harder depending on what unit you are using. Also, the more battles you fight, the more likely you get knocked out. You're advised to choose the easiest Norma under the prevailing circumstances. The level-1 Norma is collecting 10 or more stars. 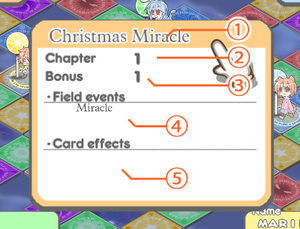 At the beginning of the Chapter, Field Event checks and the Chapter Start Bonus take place. The Chapter Start Bonus grants all Characters a number of stars based on their individual levels and the total number of Chapters passed. In addition, Card Effects that take place during the Beginning of the Chapter and the removal of over-time effects occurs automatically here. The switch to the next Chapter occurs here. 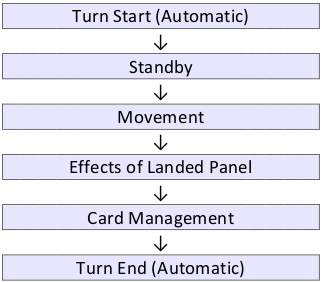 Card Effects that occur during the beginning of a Turn as well as the removal of over-time effects occurs automatically here. You may choose what to do before moving. End Standby and roll the Die to Move. Use a Card you from your hand. You may only use one Card per turn during Standby. You can check information on the Field, yourself and other Characters here. You can check player specifics by hovering the mouse cursor over their corner of the screen, or check the Field's Information by hovering the mouse cursor over the Center Deck. You may choose which path to take at a branching point. You may choose to stop at Home instead of moving your full distance if you pass over your Home Panel. If you pass over or land on the same panel as another Player, you may choose to challenge them to a battle. Battles will be covered later on. During Standby, Route Selection, and while choosing whether or not to stop at Home, you may move the Camera by clicking and dragging with the mouse. If you want to return to your Player's location, click the middle mouse button. If you land on top of a Trap Card, the Trap Card will activate and its effect will take place. Whether or not the Trap Card had any effect, after activation the card will be sent to the Trash Bin. The effects of the type of Panel you landed on, as well as any applicable Events, takes place here. If you are forced to move from the Panel you landed on for any reason, this section will be skipped. If you have 4 or more cards in your hand, you must choose and discard cards until you have 3 left. End of Turn Card Effects and removal of over-time effects occurs automatically here. If you suffer KO during your turn (your HP becomes 0), all subsequent steps up to Card Management will be skipped. If you are KO'd at the start of your turn, the normal turn progression will not occur. Instead, you will be given the chance to Recover. If you roll equal to or higher than the Recovery Value shown on the screen, then your HP will restored to max and you will recover. 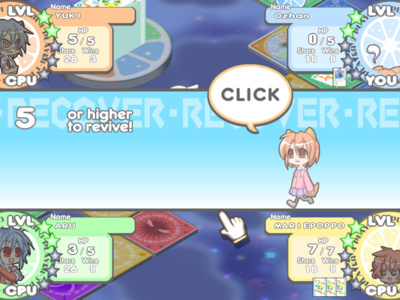 The Recovery Value will be lowered by 1 every time your turn comes around and when it reaches 1, you will recover automatically without having to roll the die. After Recovery, you will immediately proceed to Card Management phase. The initial Recovery Value is normally set to 5. 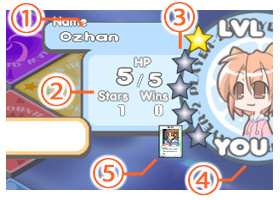 However, Characters with the "Recovery Value" term in their Character Cards will start Recovery at a different number. Whenever you challenge someone, are challenged by someone, or stop on an encounter square, a "Battle" will occur. In general, the attacker will gain the first attack (left side), whereas the defender will attack second (right side). The Character who attacks first. The Character who attacks second. The Character's current amount of HP. The Attribute values are displayed after any changes from cards, etc. After Damage Calculation, the Attacker and Defender will swap roles. The First Attacker and Second Attacker will each attack once. Cards that take effect at the beginning of battle will have their effects taken care of automatically here. You may use a card you are currently holding. You may only use one card per battle. After choosing, both players will simultaneously reveal their cards and their effects are applied. The Attacking Player rolls the die. The resulting number is added to the Character's Attack statistic and becomes the Attack Value. Results of 0 or less will be treated as a 1 (you cannot have an Attack Value of 0 or less). The Defending Player may choose to Defend or Evade the attack. The Defending Player rolls the die. 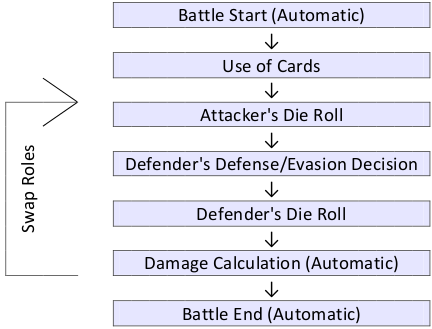 If they chose Defense, the result is added to the Defending Character's Defense statistic to become the Defense Value, whereas if they chose Evasion, the result is added to the Defending Player's Evade Statistic and becomes the Evasion value. After both sides have rolled the dice, damage calculation occurs. The calculations are different for Defense and Evasion. However, if the Defense Value equals or surpasses the Attack Value, a minimum of 1 damage will always be dealt. If, due to battle damage, the opponent's HP becomes 0 (they become knocked out), then a Win is accrued. 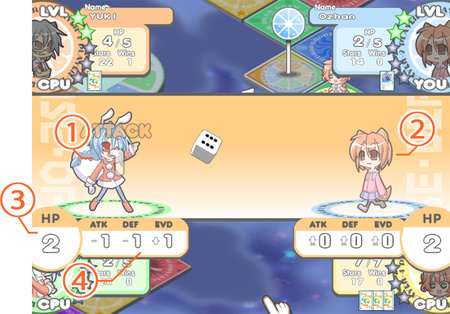 In this case, the Player gains a number of Wins depending on the opponent. 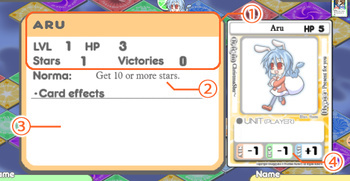 In addition, the victorious player steals the defeated unit's stars. If the opponent was a Character, half their stars are taken. If the opponent was a Boss or Wild Unit, then all of their stars are taken. Wild/Boss Units have an amount of stars equal to an amount that they start out with, plus any stars they steal from Player Characters. The amount of stars they start out with grows with the amount of times they are knocked out. 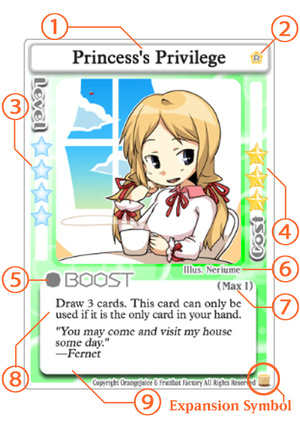 The terms used in-game and on cards have special meanings. Each have specific rules tied to them. This indicates the Character or Card's controller. Unless mentioned otherwise, this indicates other Player Characters. Any HP or Attribute modifications will apply to this Unit. This indicates the Player or something of the Player's. This indicates a different Player Character other than the Player him/herself. This indicates a Unit who is brought from 1 or more HP to 0 HP. *Note that the effect "Cannot be KO'd" means that the Unit will not be reduced to lower than 1 HP. This refers to when a Unit is brought to 0 HP from 1 or more HP in Battle. This refers to taking the top card of the Center Deck and putting into your hand. This refers to both the Level Requirement and Star Cost of a card. HP will never become negative or greater than a Unit's maximum HP. In addition, cards that cost HP in order to use cannot be used if they will KO the Unit. HP will never become negative or greater than a Unit's maximum HP. A KO'd Unit cannot be targeted or affected. The target loses X HP. HP will never become negative. A KO'd Unit cannot be targeted or affected. Boost Cards and damage from battle will be referred to as "Dealt" damage, whereas any other source of damage will be referred to as "received" damage. Increases HP by X. This cannot bring a Unit above its maximum HP. A KO'd Unit cannot be targeted or affected. HP will be set to the Maximum HP value for that Unit. The Unit will become able to take action again in the next turn. Unless specified otherwise, the revived Unit will be restored to maximum HP. 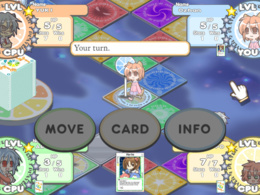 This effect lasts until the end of the turn of the Player who activated it. These abilities take place during specific events that are specified in the card rules. Until the effect activates, this ability will remain on the Unit. Unless specified otherwise, these abilities expire after being used once. This refers to a Stock ability on a Player or the Field. You can check on these effects by using the "INFO" button. 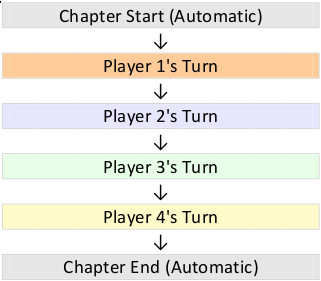 Duration is calculated from the start of a Player's turn until the start of the same Player's next turn. Chapters are still counted for KO'ed Units. The specified effect takes place for N Chapters. During this time, as long as the conditions are met the effect will take place. This can checked on with the INFO button. This effect takes place until the game ends. Unless specified otherwise, these effects cannot be removed. You can check on these effects with the INFO button. 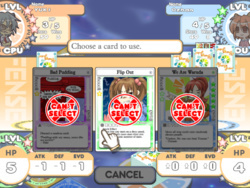 Boost, Battle, and Event cards are used whenever the "CARD" option is displayed, whereas Trap cards are placed onto the current panel instead. Any costs are paid at the time of use. "Cannot be used ~" indicates conditions that dictate whether or not a card can be used, but these conditions need not be met for when the card's effect actually takes place. The number/status of cards in one's hand is referenced to immediately when the reference is called for. The moment a card is used, it disappears from the hand. Cards that are Discarded will be removed from the Player's hand and will travel either to another Player, or to the Trash Bin, depending on the effect. Used Cards and Activated Traps are thrown into this card holding space. If a Player attempts to Draw a card when there are no cards left in the Center Deck, then the cards in the Trash Can will be shuffled and added to the Center Deck. This indicates the battle that occurs when a Unit lands on an Encounter Panel. 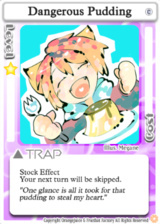 Boost cards directly affect a Player (or place a Stock Effect on them). Some Event Cards that don't indicate any particular targets affect the Field (or place a Stock Effect on it). Effects on Players will only exhibit that effect on that Player. Field Effects will exhibit their effect whenever the effect's conditions are met during the game, while the effect is in place. Effects on Players and the Field (including Stock Effects) can be checked on using the INFO button. Multiple players can play together over the Steam network. Multiplayer is accessed from the Free Play menu. 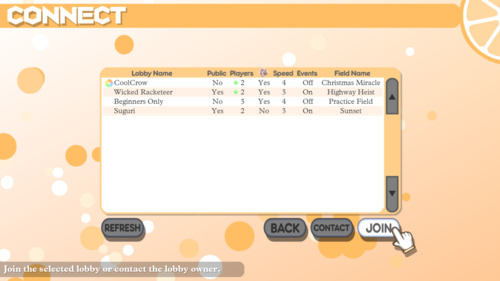 One of the Players in the game must create a lobby and act as the server. The rest of the Players can join that lobby as clients. You can decide on which map you want to play on. More map choices will be available to you depending on your campaign progress. You then need to give your lobby a name for all Steam players to identify it with. Your lobby also has some options that you can set. 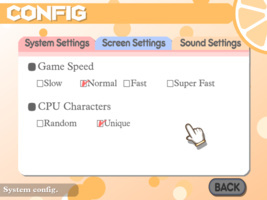 Game will remember these settings for you to use later. Including your lobby name and pass. If you want your game to be private, to play with only your friends whom you share this password, you can write it here. To ensure fair play, or just because you are scared of her, you may dis- allow players from selecting Tomomo as their player character here. You can set the speed of the game you are running on your server from here. Works exactly the same as setting it elsewhere. You can enable/disable the field events on your server here. When you click OK, your lobby will be created and you will be taken to the Game Lobby screen to wait for other players to join. While other players will see it listed on the Connect screen. When you are happy with the number of human players that joined to your server, you can hit begin to start the game. Remaining slots will be filled with the computer players. At the Connect screen, you can see the games currently waiting for players. You can first click to a lobby and then the JOIN button to connect to that game. If that game is password protected you will be asked to enter it. If you do not know the password, you can click the CONTACT button to ask the Lobby Owner for the password using the Steam chat interface. Public No means that this lobby is password protected. *A green star means that you have a Steam friend in that lobby. While playing multiplayer you will notice a time display attached to the player info panels. The time each player can spend is limited to discourage walking away in the middle of online matches, making others wait. When that time runs out, computer will play for you. If you time out three times in a single match during a public game, you will be kicked out. You have 60 seconds to play your turns, 40 seconds to defend on other players turns if they attack you and 20 seconds to roll when you are dead. After a multiplayer game completes, all participating players will gain experience. Winner gains more experience than others. The experience everyone gets depends on various factors, but in summary, the better your success, the more experience you get, even if you don't win. By gaining certain amounts of experience, you level up. At certain levels you unlock new items at the shop to use at multiplayer and even some that will make all your future shopping sprees more affordable. Q: The game's too hard for me to finish. What do I do? Each unit has a different way of winning. You're advised to fight many battles and beat a lot of units. Or alternatively to avoid collecting stars in the first half, and try to get a lot in the second half. The key is to find out how to win. Q: The game's still too hard for me to finish. What do I do? Some cards can somewhat control the game. Try building a deck with cards that benefit you but hurt your opponents. Q: It's STILL too hard for me to finish. What do I do? Every Unit has their own special characteristics, and may find themselves at a disadvantage in certain fields and against certain opponents. Try changing your Character depending on the situation. Q: I'm getting alerts from security software. Some security software (or their settings) may display warnings when you start the game. You can either ignore the warnings after checking if there's any danger, or set this application as Safe in the software's settings. Note that if you allow security software to block the game's access to Internet, you may not be able to play Multiplayer games. Q: The game won't run. Change your Hardware (particularly your graphics card) settings. *Example: Change "High Quality" to "Performance", etc. Q: The game won't run past the "Now Loading" screen. Some Environments may take some time to load the game. Try waiting patiently. 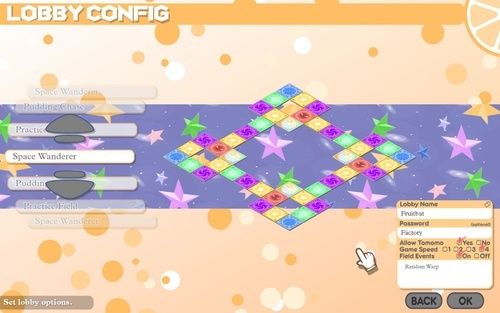 In particular, the game takes time to load during the initial start-up, and whenever creating a game board. Q: I failed to Install/Uninstall the game. Failing to Install/Uninstall the game using the standard Installer may cause problems with your OS. Close other applications when running the Installer. If an Error message appears, take action according to what the error was. If you are unsure, please contact support. Q: I want to restore the settings back to default. If you want to restore the game settings back to default, simply delete the "config.dat" file in the game folder to restore all the settings to their defaults. *Player Data will not be lost. Q: I locked the game by holding down the shift key. This is caused by a settings option of the OS you're using. If your keys are getting locked, set the "Lock Keys Function" to Off in the appropriate settings menu. We try to support you as much as possible. Please contact us when you find any bugs or trouble on the game. However, please understand we cannot always provide the right answer because there are many kinds of computer environments out there. All rights are reserved by Fruitbat Factory and Orange_Juice. Unauthorized use of the game or its components or sharing them to third parties is forbidden. You may share snapshots, videos and game info taken from the game in any non-commercial way you see fit.